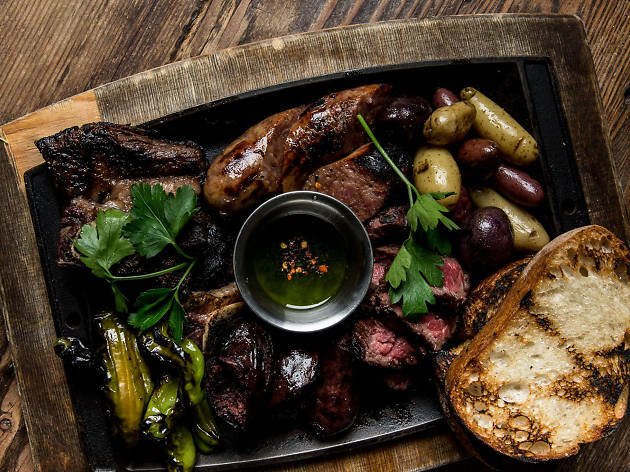 We love the thrill of tucking into a massive meal—dim sum spreads, hearty pizza pies, huge cuts of steak at SF’s best steakhouses—but in a sea of super-sized options, it feels refreshingly refined to scale down. 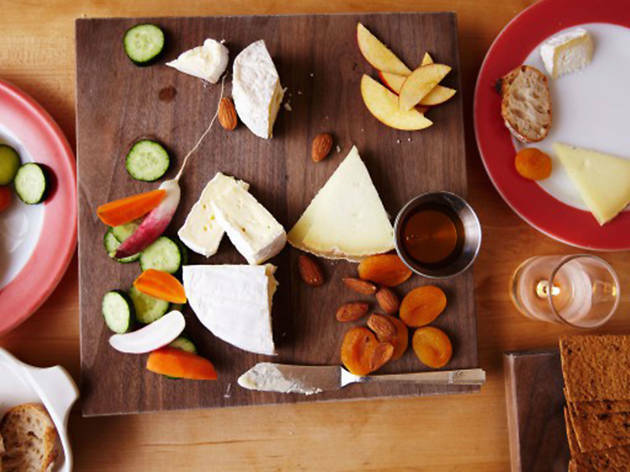 Enter tapas: as chic as they are delicious, small plates somehow pull off being both elegant and adorable. Plus, you can mix and match plates to create a bespoke feast, and you get to try a little of everything without committing to one dish. 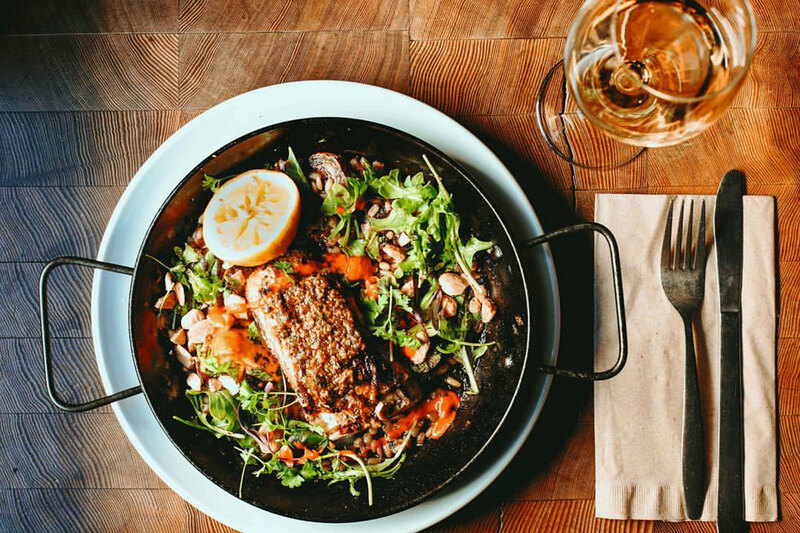 We’ve hunted down the best tapas in the city so you can see—and taste—why small plates have such big appeal. 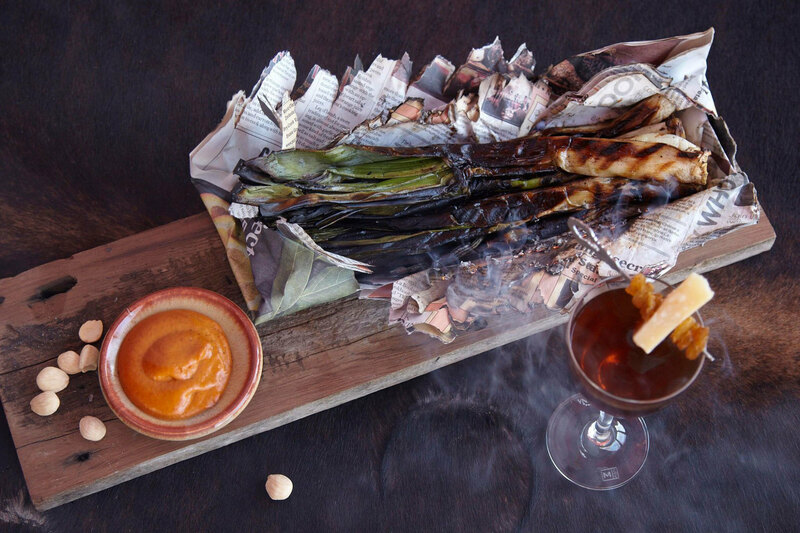 We’ve already crowned 20 Spot one of the nation’s best wine bars, but we’d be remiss not to celebrate the Mission eatery’s equally stellar small plates. 20 Spot’s atmosphere is sleek, warm and just the slightest bit kitschy, with midcentury furnishings and an all-vinyl soundtrack that balances the kitchen’s contemporary take on Mediterranean small plates. On the ever-changing menu, standby mains—kitchen favorites include octopus and flatbread— are paired with seasonal accouterments like lemongrass quinoa and jalapeño sofrito. 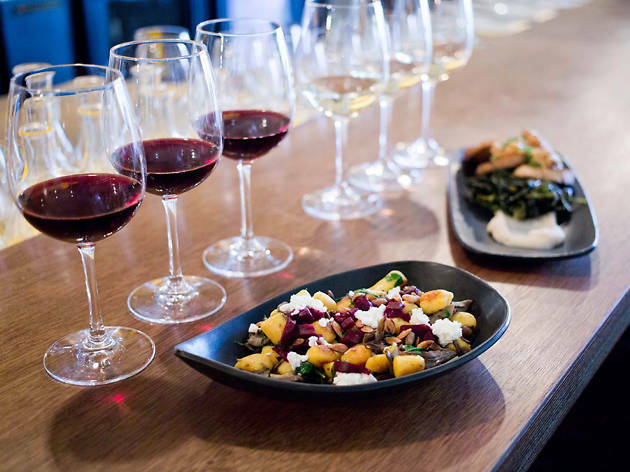 Our favorites included Brussels sprouts fried in duck fat and enlivened by pickled onions, and 20 Spot’s famed avocado toast, in which an arguably overdone dish is elevated with tender, salty halibut ceviche. Trust us, it’s worth the hype. 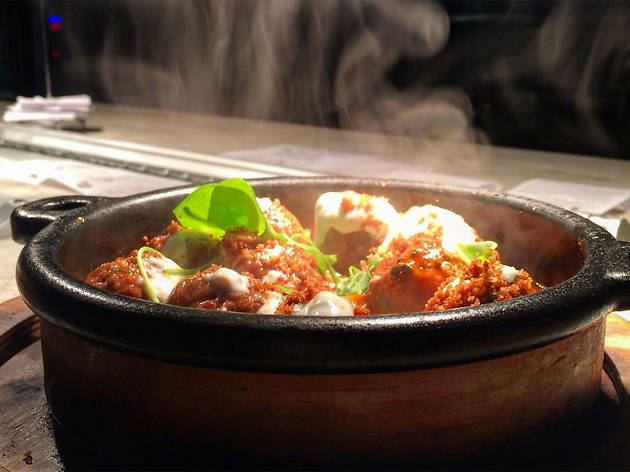 If you’re looking for traditional tapas in a sophisticated space, Aaxte (pronounced aah-CHAY) can’t be beat. 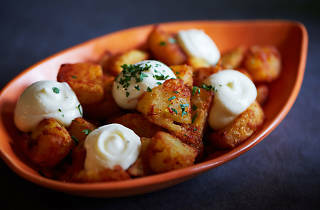 Basque Country-inspired plates include expertly executed classics like jamón ibérico and patatas bravas, as well as more adventurous dishes: pickled grapes are an unexpected but utterly delicious addition to the marinated squid salad, and the roasted autumn squash with yogurt and walnut brown butter is incredibly satisfying on a chilly night. Pro tip: if your party is small, head for the chef’s counter, where you can watch the kitchen make its magic. 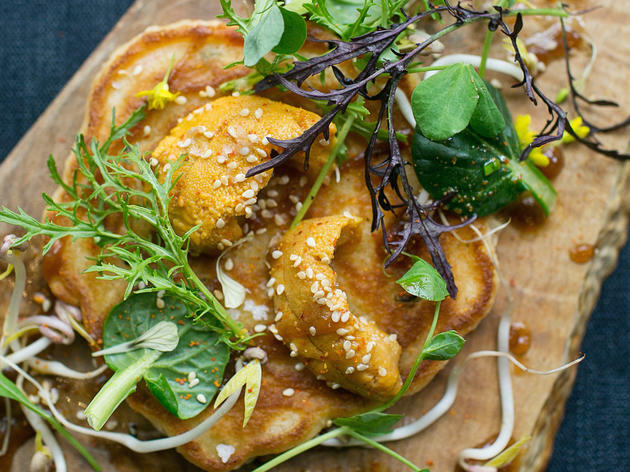 With a Michelin star and two James Beard Awards under its belt, State Bird Provisions has a lot of hype to live up to. 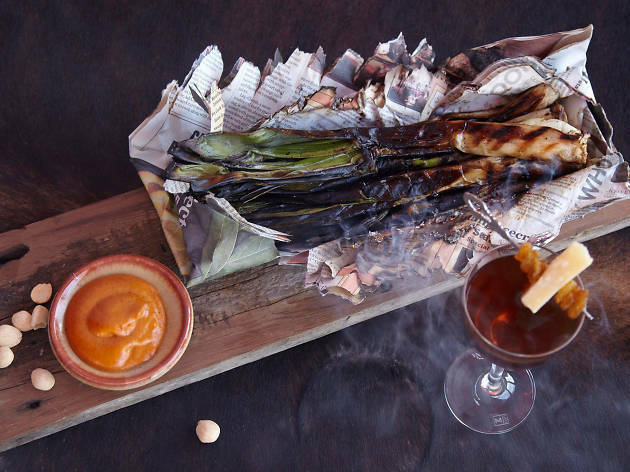 Thankfully for foodies across the Bay, this Western Addition haunt’s small plates are every bit as exceptional as you’d imagine. Artfully crafted seasonal snacks are carted around the restaurant, dim sum style, so you can look before you leap into a dish. 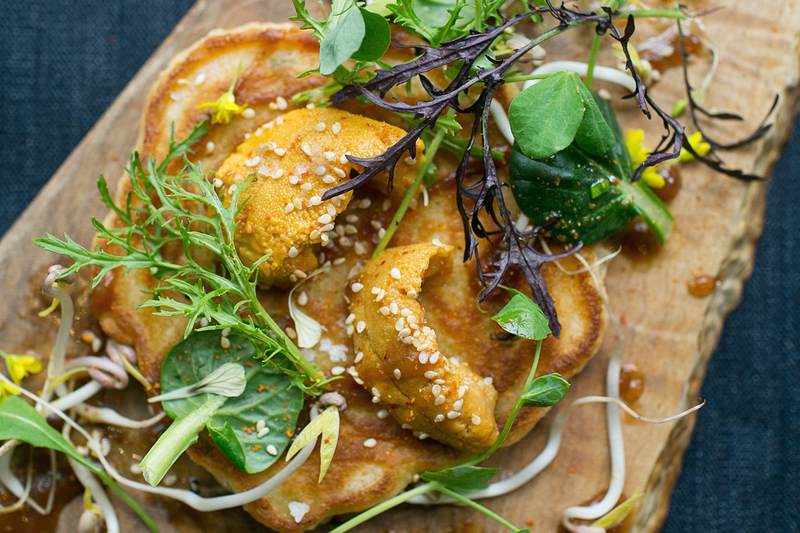 Our picks include fresh-as-it-gets local seafood like Hog Island oysters and Mendocino sea urchin, the latter of which is cooked into savory ginger-scallion pancakes. The real showstopper, however, is the namesake dish: an upscale take on fried chicken, juicy quail is battered and fried, then served atop an umami onion compote. It’s sinfully rich and utterly addictive. 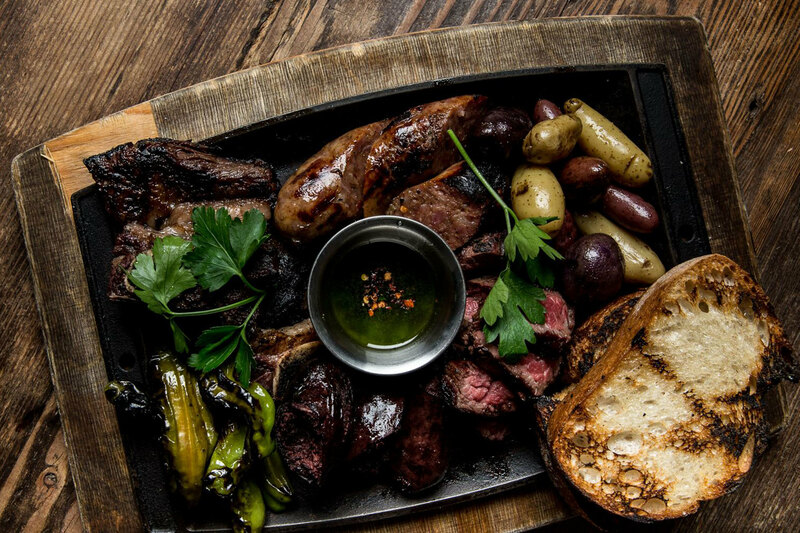 Lolinda may be best known for its steak, but it would be a mistake to skip over this Mission hot spot’s small plates. 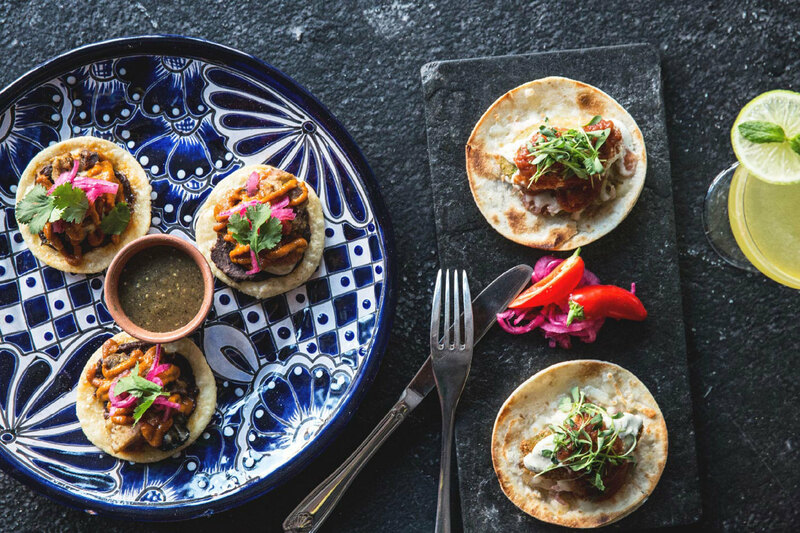 Pair a plate of traditional empanadas with one of the restaurant’s famed ceviches—Lolinda offers two options, ono and mixed seafood, and each is tangy, refreshing and topped with buttery bits of fried corn. Or indulge in the vigorón: melt-in-your-mouth cubes of pork belly, complimented by a bright jalapeño slaw. Two floors of low-lit, cosmopolitan cool make this an excellent space to grab a bite before or after a night out. Don’t let the restaurant’s spaciousness fool you, however: make reservations, or expect to wait. 15 Romolo settled into North Beach’s shuttered Basque Hotel in 1998, but the romantic watering hole’s atmosphere is closer to 1928; wood paneling, dusky lighting and classic cocktails like martinis and Pimm’s cups will have even the most modern diner feeling nostalgic. A globe-trotting menu includes dishes as diverse as grilled octopus and poutine, but it’s the American classics that really shine: sticky spare ribs are meltingly tender thanks to an oloroso marinade, and the French fries arrive golden brown, piping hot, and accompanied by curried ketchup and house-made buttermilk ranch. Chock full of ceramic dogs, pom-pom lamps and a patchwork of pop-art wallpapers, Loló resembles a mash-up of a thrift store and a summer getaway mood board. 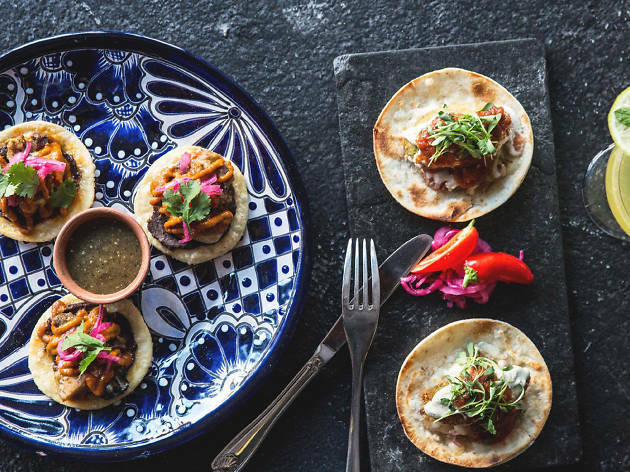 The Mission eatery’s food is equally bright: you’ll find Mexican food with a California twist, like crispy-creamy panko-fried avocado tacos and seared pork belly salad with mint, fennel and curried peanuts. We recommend rolling in with as many friends as you can find—not only is the festive atmosphere perfect for parties, but more guests means you’ll have an excuse to order one of everything. Wine Kitchen owners Greg Faucette and Jason Limburg combined their fine dining pedigrees—they’ve worked at the likes of Per Se and Bar Tartine— with a devotion to simple, flavorful dishes; the result is the sort of laid-back, yet refined, neighborhood spot that’s perfect for meeting friends over a glass of vino. (The menu is helpfully annotated with wine pairings for each dish, so the even least experienced among us can play sommelier.) Must-try dishes include big eye tuna crudo on a bed of fluffy quinoa, and a chiptole bread pudding with honeydew, cucumber and heirloom tomatoes that’s a true a why-didn’t-I-think-of-that winning combination. 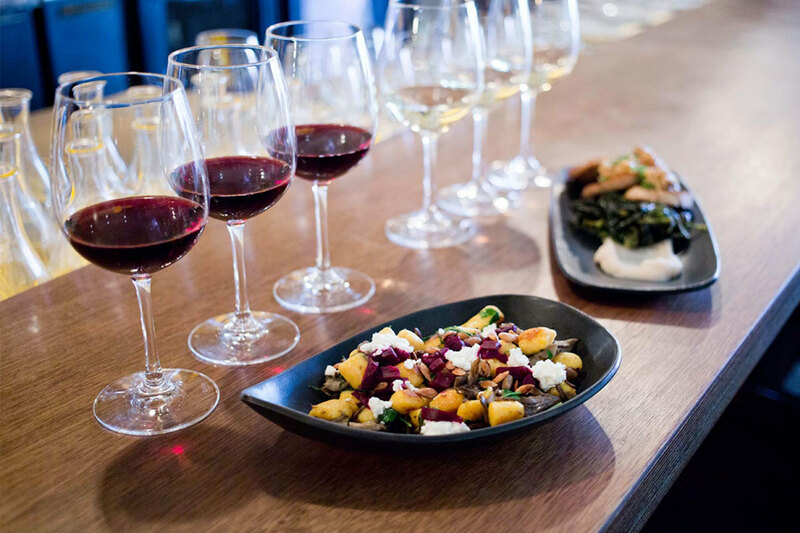 If you aren’t sold yet, consider this bonus: while Monday is a closed day for many restaurants, Wine Kitchen is not only open, but offers half-off all bottles. Low lighting, soft jazz and a comprehensive wine list make Beso Bistronomia the perfect spot for date night in the Castro. Here you’ll find traditional Spanish cuisine, prepared simply but skillfully with fresh ingredients. 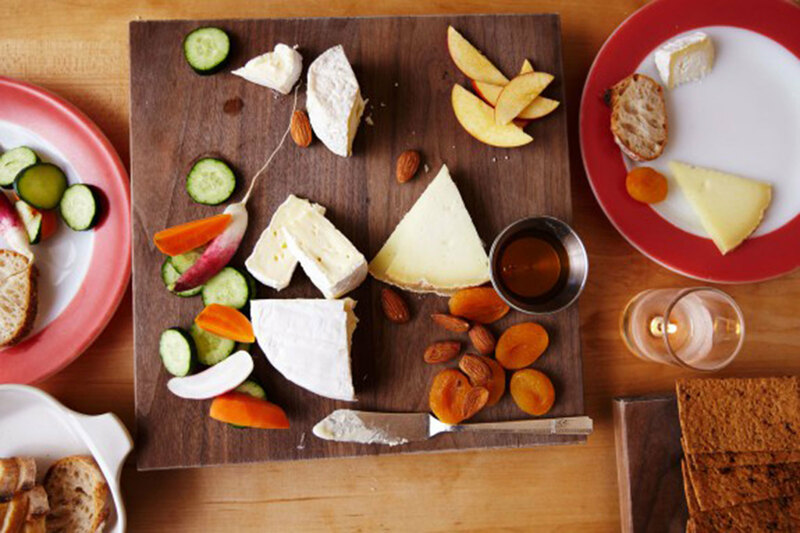 (Beso’s produce is exclusively sourced from local farm Napa Kitchen Gardens.) 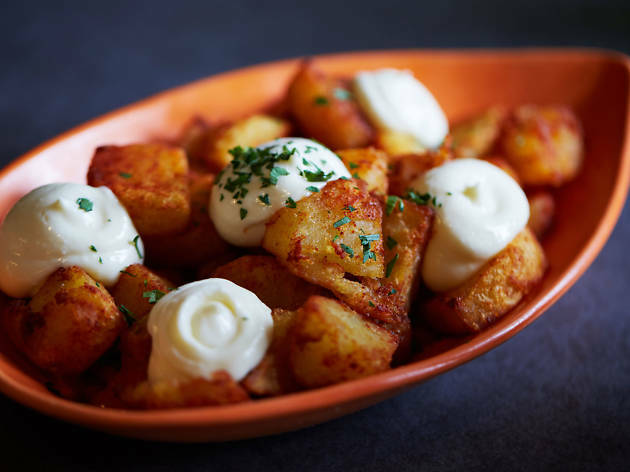 The patatas bravas are pure Catalonian comfort food: after all, if anything is better than fried potatoes, it’s fried potatoes with spicy tomato sauce and dollops of savory cream. 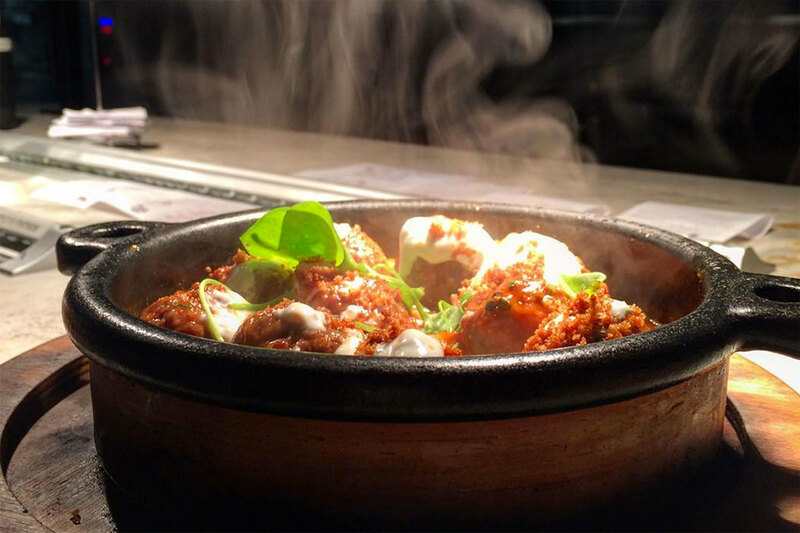 If you’re looking to share something more substantial, Beso Bistronomia offers perfectly cooked paellas with ingredients like chorizo, lobster and plenty of saffron. 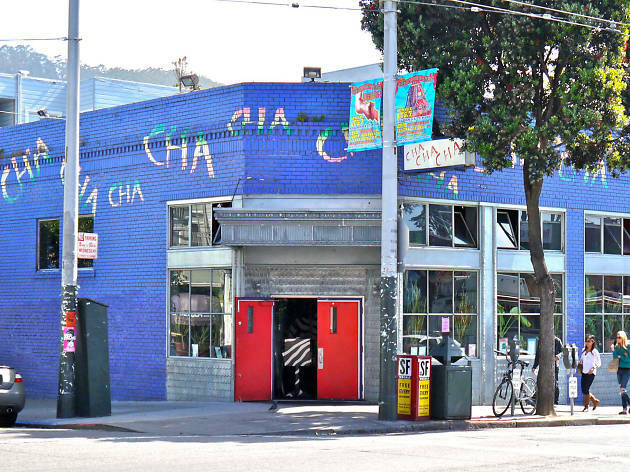 Cha Cha Cha offers all the fun of small plates with none of the fussiness: in this New World eatery, you can enjoy a pitcher of sangria beneath a glittering Santeria altar, and compliment your seafood paella with a side of jerk chicken. Garlicky black mussels, steamed and served in an aromatic saffron broth, are full-flavored without overwhelming your palate; pair them with a dish of savory plantains and a tropical beverage, and you’ll want to thank the orishas. 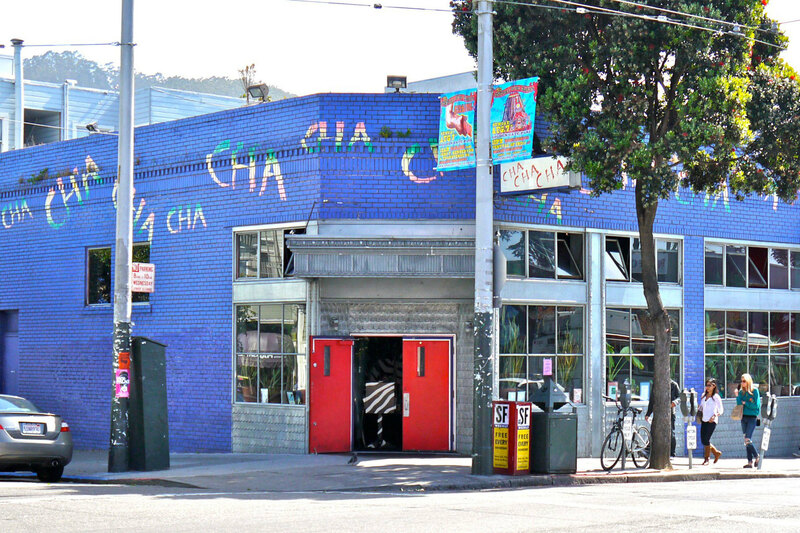 A word to the wise: come at an off-hour, or be prepared to wait—Cha Cha Cha is proudly first-come, first-served. 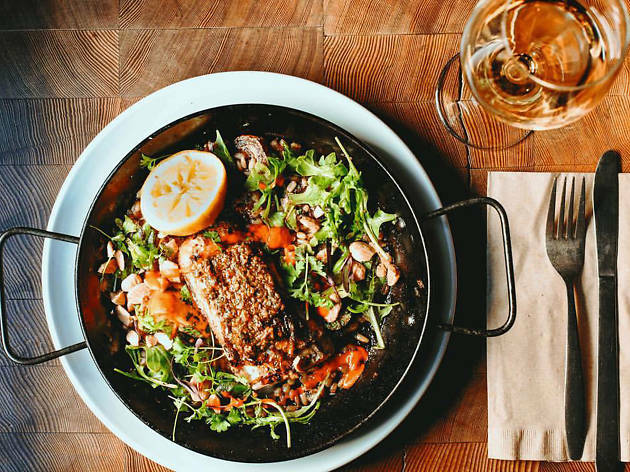 Coqueta’s sweeping views and contemporary Spanish cuisine make this Embarcadero eatery—located just steps from the Ferry Building—a favorite of sightseers and locals alike. (The restaurant is also a boon for Giants fans hoping to fit in a snack before the game.) The house gin and tonic, mixed with Spanish spirits and garnished with rose and juniper berries, is a reliable pairing for succulent head-on gulf prawns poached in olive oil and sprinkled with chili sauce and crispy black garlic. Add an order of salmon ahumado—smoked salmon with queso fresco and truffle honey on toast—and market vegetables for an ideal Mediterranean light lunch.